Curled up on the laps of Kumaon Himalayas, the trek route to the magnificent Pindari Glacier is adorned by lush rhododendron forests and some rarely seen varieties of flora and fauna. Besides mountaineering enthusiasts, the moderately difficult Pindari Glacier trek is perfectly suitable for families and children alike. As you hike through this 90 km long trail, you leave behind, one by one, montane villages of Uttarakhand's Kumaon region that seem to be straight out of folklores. The mighty snow-clad peaks of Nanda Devi, Panwali Dwar and Maiktoli loom at a distance and all of these together take you through an enchanting landscape that, once experienced, remains etched in your mind and heart forever. Depending on your fitness the entire trek should not take more than 7 days. Day 1: Starting your journey from Loharkhet, you can board a jeep for Kharkiya-the last village on the road from where you're all on your feet. Thereafter, you trek through dense forests, lush infinite meadows, and cross a few bridges until you end up at Khati. You can seek accommodation at one of its many private guest houses, until you set out for Dwali the next day. Day 2: The trail from Khati to Dwali is 13 km long, fractured and almost non-existent at some places due to frequent landslides. It is advised to start early in the morning as the weather in this region is really unpredictable. You can opt for a reliable guide from Khati as they hold a much better knowledge of the secret trails through the forests. Spend the night under the stars at the Dwali camping site right next to a PWD guest house. Day 3: From Dwali, your next stop is at Phurkiya which is barely at a distance of 5 km. The trail might be a comparatively shorter one but a steady altitude gain awaits you. It takes you through breathtaking rhododendron forests with oak trees forming a green canopy above your head. Camp at Phurkiya overnight as this is going to help your body acclimatise for a long next day. Day 4: The trek to Pindari Glacier ends at Zero Point, going beyond which demands special permissions. Leave early in the morning on this day and aim at reaching Zero by 9 am if you don't want to fall prey to the whims of the weather. The walk is going to be a bit challenging as you might have to overcome ice fields and frozen streams depending on the time of the year. But once reached, the 4 hours of strenuous hike literally pays off. When you find yourself encompassed by massive snow-capped mountain peaks from three sides and there is 5 km long chunk of glacier to the left, know that you've reached Zero Point. The beauty is other-worldly; soak it all in before you set out on your way back to Phrkiya. Next 2-3 Days: Take your own time to return back to Loharkhet, Bageshwar or Kathgodam as per your convenience. Still didn't have enough of the mountains? Halt for a couple more days at one of the villages and observe the mountainous way of living. In short, be a local. 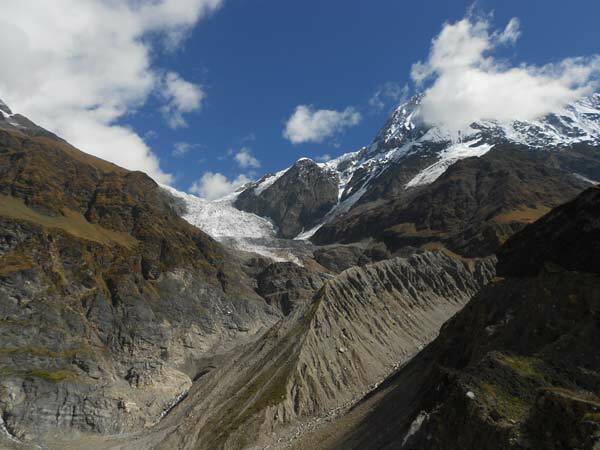 Plan your trek either during summer-which is from the months of March to June-as it is much easier to acclimatise during this season than the rest of the year. Or you can do this trek even in the months of September-October, when the weather is much more pleasant and is preferred by most trekkers. During the rest of the year this trail remains closed either due to heavy monsoon or severe snowfall. By Air: The nearest airport is Pantnagar Airport which is approximately 205 km from Bageshwar. From Bageshwar you need to take a shared cab to reach Loharkhet, Kharkiya, which is going to be the base camp of your trek. By Rail: Kathgodam, 171 km away from Bageshwar, is the nearest railway station. By Road: Regular buses to Bageshwar are available from Delhi Anand Vihar ISBT, Haldwani, and Almora. So if you are someone whose feet itches almost all the time for mountains and more mountains, the Pindari Glacier trek is the right calling for you.